It’s not entirely clear at what point Donald Trump figured out that House Democrats were going to seize his financial records today. Was it over the weekend, when he had one of his most bonkers Twitter meltdowns to date? Was is this morning, when he began attacking Nancy Pelosi in berserk fashion? In any case, Trump now seems to understand just how poorly today is going for him. 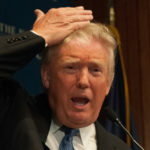 Even as William Barr prepares to release portions of the Mueller report in the hope of fending off the subpoena for the full report, and Donald Trump’s attorneys beg the government not to hand over his tax returns, Trump is losing some more immediate battles today. House Democrats just issued a friendly subpoena to infamous Russian money launderer Deutsche Bank, specifically seeking Trump’s financial records with Russia, and they also subpoenaed Trump’s accounting firm. These subpoenas give these institutions legal cover to cooperate, and prevent Trump from being able to do anything about it. So maybe this was on Donald Trump’s mind this morning when he took yet another shot at trying to convince his violently deranged base to bring harm to Congresswoman Ilhan Omar. Perhaps it helps explain why, when the nightmarish fire broke out at Notre Dame Cathedral in Paris this afternoon, Trump inexplicably tweeted that the French should use “flying water tankers” to fight the blaze. And perhaps Trump was trying to shore up his base ahead of the bad news, when he insisted this evening that the steel industry is magically making a comeback. In any case, it’s not difficult to parse that Donald Trump is at least partly aware of just how bad today’s news has been for him. Even as House Democrats continue to fight for the Mueller report and Trump’s tax returns, two battles they’ll win eventually but not imminently, they won today when it comes to Trump’s banking and accounting records. Deutsche Bank has been busted for facilitating the laundering of billion of dollars of Russian money into places like New York City. We’ll see what comes of it.